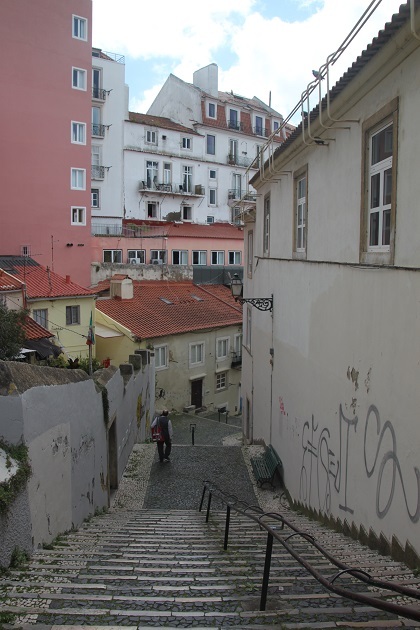 After we had explored all nooks and crannies of the castle in Lisbon we strolled through the Alfama neighbourhood on our way back down towards the river. This is definitely a good plan if you want to save your legs. The whole area is super hilly and walking down rather than up through the steep, narrow, cobbled streets was for us the best way to do it. The Alfama is Lisbon’s oldest district, you can definitely tell. Apparently the name Alfama comes from the Arabic word al-hama meaning spring or bath – a reference to the hot springs in this area. 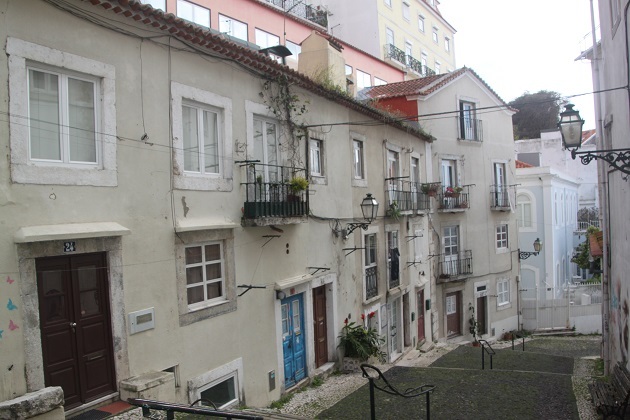 The hard bedrock formation saved Alfama from much damage in the devastating earthquake. All of us enjoyed our wandering here. The whole place is like a delightful maze. There are narrow, cobbled streets, tiny squares, churches, pastel houses and loads of steep steps. 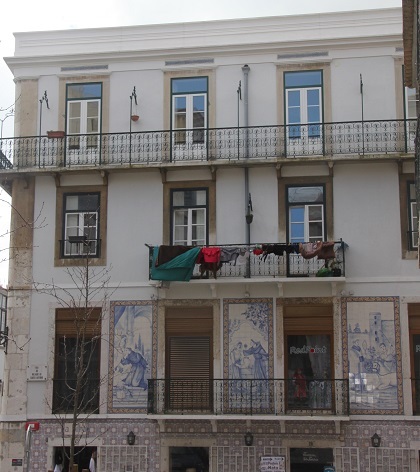 Everywhere we looked there was laundry flapping in the breeze and colourful flowers on the balconies. In some places the houses are so close together they almost touch. Prior to the 13th century this neighbourhood was outside the city walls and home to the poorest residents. Then it became home to dock workers and sailors, nowadays it is trendy and fashionable. 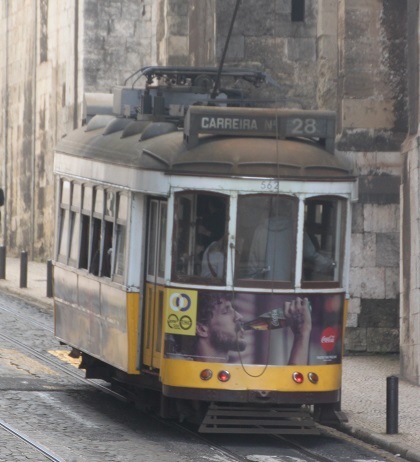 We strolled through the beautiful streets, took in the sights of Lisbon below from a couple of lovely viewpoints and soaked up the atmosphere. The alleys and squares are a little confusing but it is a relatively compact area, once or twice we circled back to the same place but we really didn’t mind. I loved the little shops dotted here and there filled with quirky souvenirs and intriguing things to buy. 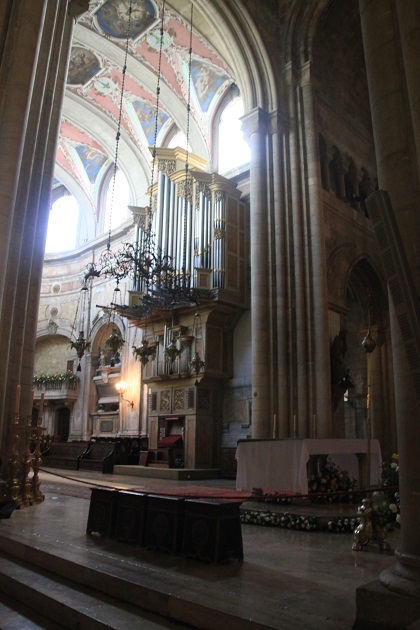 We ended our Alfama exploring by going inside the Se Cathedral. 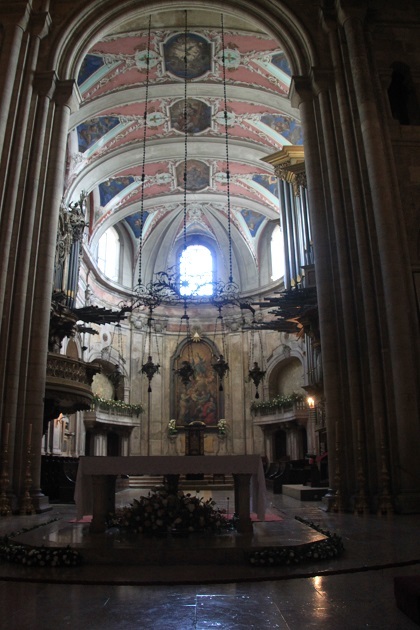 This is Lisbon’s oldest church and most iconic religious building. 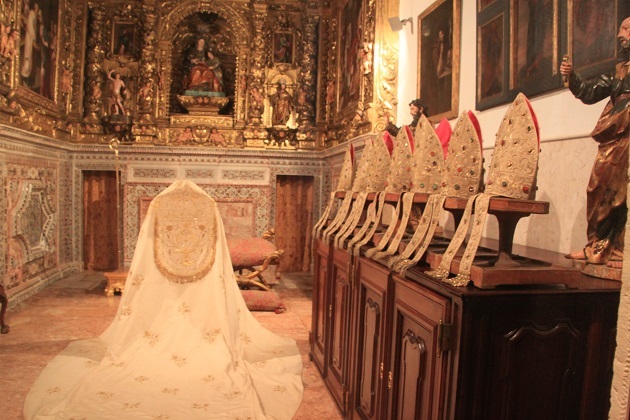 It dates back to 1147 and has borne witness to the baptism, marriage and passing of Portugal’s nobility down the years. Definitely a stunning and imposing building, we thought the outside looked more like a medieval fortress than a church. The stone walls are massive and the two towers are really impressive. 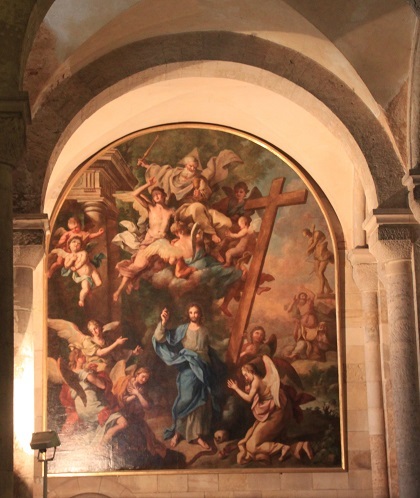 They keep the remnants of Lisbon’s patron saint – St Vincent – here but we didn’t find him. We just wandered around inside taking in the mix of architectural styles. You can explore the nave, transept and sanctuary however the cloisters require an admission fee. We gave these a miss. Son had had enough of being indoors and a little restaurant just down the street with delicious pastries in the window was calling his name. Lunch next and a chance to rest our weary limbs before we headed to the river and a ferry ride across to the other side. It’s so often that the non-tourist sections of a place tell the best stories. Completely agree, so nice to wander and explore where most of the tourists don’t and get a true feel for the place. Did you happen to buy any pottery? I love wandering along narrow streets and alleyways. Washing lines always fascinate me. When it’s hanging so high from windows, I wonder how often things drop off, never to be seen again! Another enjoyable post Joy, thank you. M.
The streets around this area were just gorgeous and perfect for random wandering. I have so many pictures of laundry and washing lines from different places, our son thinks I am obsessed! Sounds like a beautiful visit! It was – a gorgeous area and perfect for strolling. 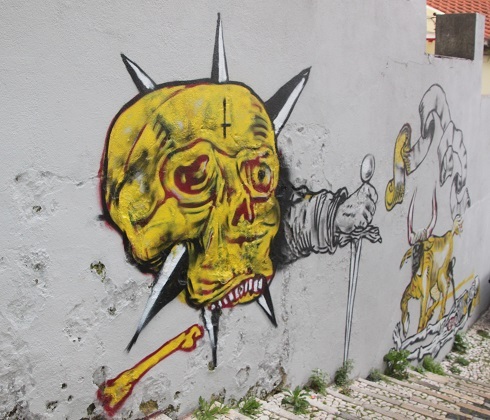 I loved the street art and gritty feel to the area. This is a gorgeous area of Lisbon Rosemary and we all enjoyed our strolling although the decision to walk down rather than up was definitely a good one. We had mixed weather during our trip but that day was a hot one, hiking up loads of steps would have been sweaty work. I could have spent a lot longer in the cathedral but agree with you, as a child I would have been exactly the same as our son and been keen to get to the bakery!! 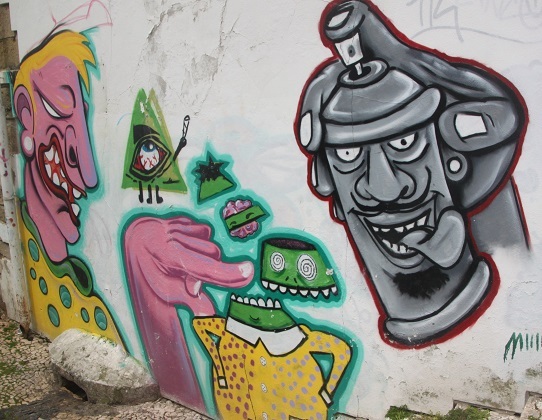 It looks like a vibrant part of the city, love some of the street art you took pictures of. I’ve never heard of that part of London! Walking around city always allow you to discover amazing places!! Joy, I love cobblestone streets and laundry flapping! 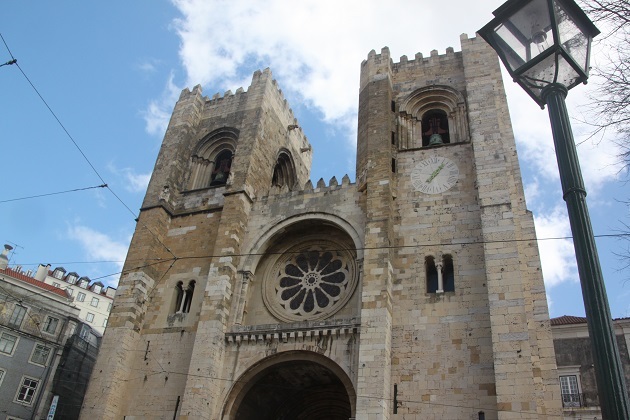 I have Lisbon on my must-see places! Thanks for sharing! This is a wonderful area to explore for sure Pam – plenty of laundry and cobblestones!! I love them too. What an adorable little neighborhood. When you described the laundry blowing in the breeze, and the colorful flowers, I can just picture it! It’s just gorgeous, I really love those areas that are a little bit shabby but so beautiful and nothing makes me take a picture quicker than some laundry!!! Definitely George – down was the way to go here!! It is a gorgeous city – highly recommend! !